Emperor Penguin and Baby Printed Wall Decal Drawn by Diesel & Juice Illustrations. Please note: Colors may vary slightly from the image above. Huddled together to keep warm from the chilly arctic air, this emperor penguin is taking good care of her baby! Known to spend up to two months at sea to hunt food, mother emperor penguins return home with bellies full of squid, krill, and fish to feed their chicks. 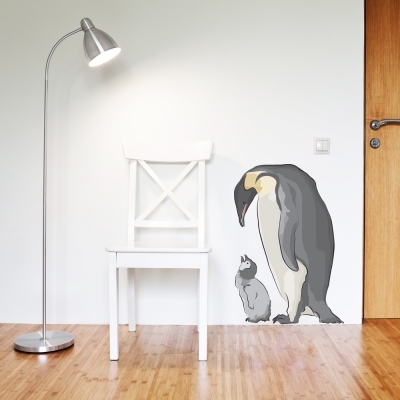 Enjoy this life size duo (average penguin size is 45 inches) in your home, classroom, or office!